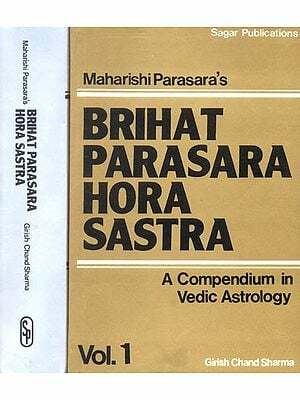 Our ancient sages (Rishis) have introduced such a fine method in Horashastra that can help us find out the benignity and malignity of planets and their influence on the life of mankind. They produced a system that can be helpful in finding out the lines and points. The system is called Ashtakavakga. By this system it is easy to find the good and evil effects of the deeds of a man. 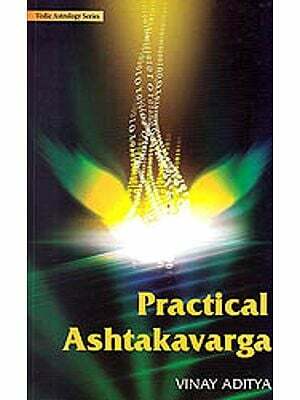 Even a learned and well-educated astrologer cannot attain the desired success without the knowledge of Ashtakavarga. It is not possible to find out the benefic and malefic results caused due to the merits and demirts of the horoscope of a person without the knowledge of Ashtakavarg. The author of this book had started studying the system some twenty years back and came to the conclusion that there is no system better than this that could make an accurate prediction. 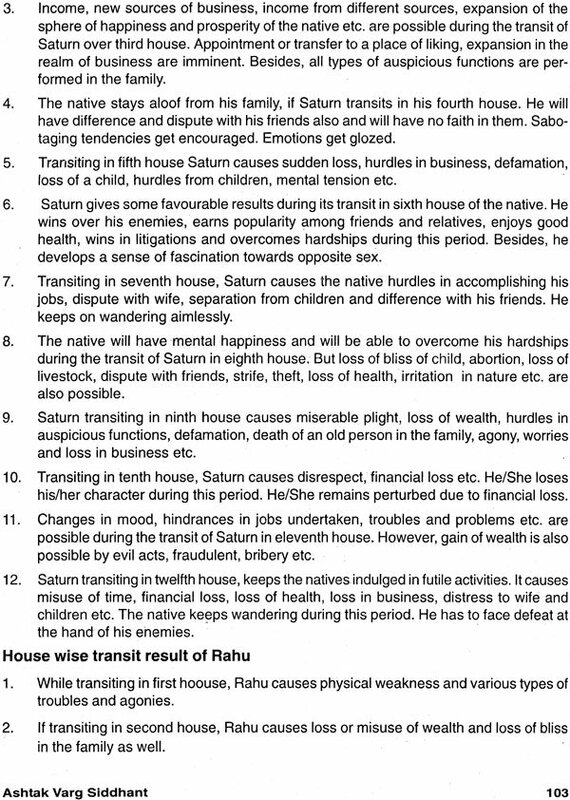 By Ashtakavarga, all the malefic and benefic outcome of the deeds of a man can be found out scientifically. With the help of this system a minute prediction can be cast. A fine theory of the relation between individual and society is applicable on this system. 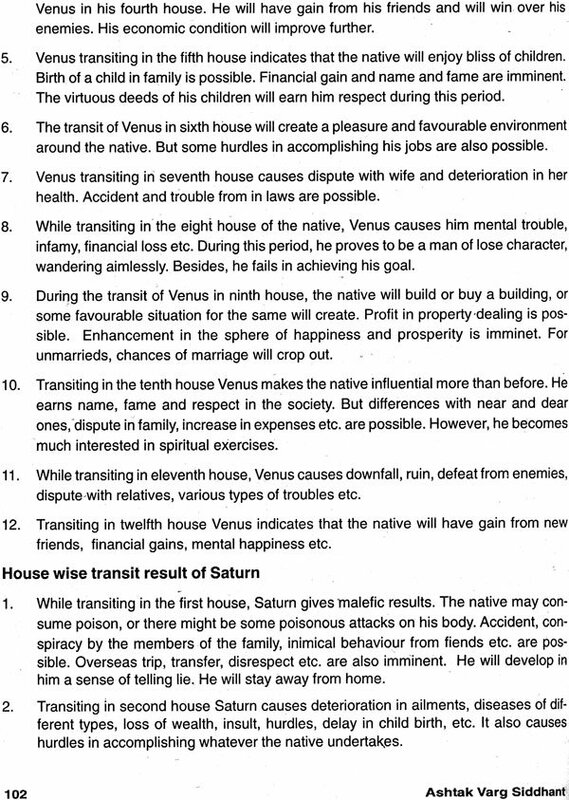 There can be some differences on the results predicted by Vimshothari and transit on the basis of planets and houses, on signs and ascendants. 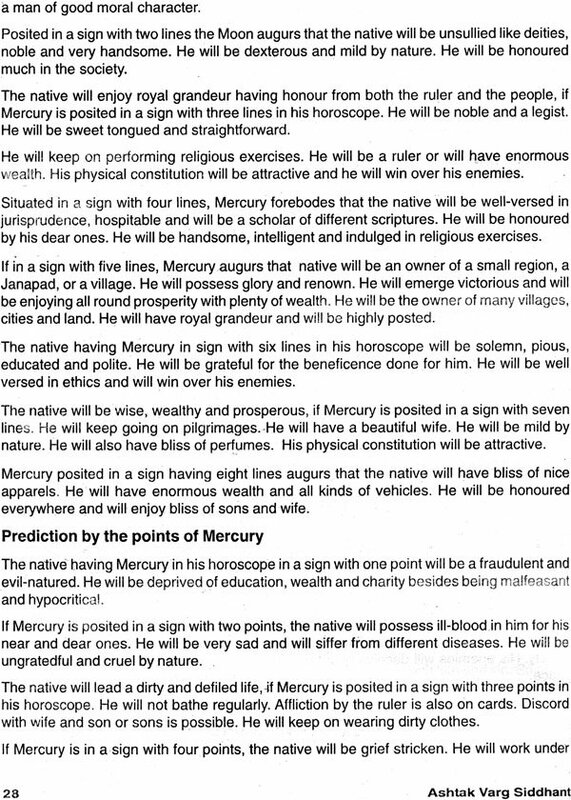 In these circumstances, how can a true prediction be made? 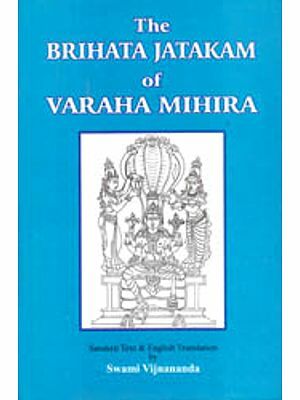 That is why, the ancient astrologers have advised to use the Ashtakavarga system. It is very hard to find out the effects, time and nature of a planet by the common theories of Falit, but by this system, this is possible. For instance, a planet will enhance the influence related to its own house if it is conjoined with or aspected by benefic planets while situated in own, exalted or friendly sign. This is a widely accepted theory. But the question is what enhancement will take place in the sphere of the said aspect by that particular planet i.e. what will be the ratio of the benefic and malefic results? 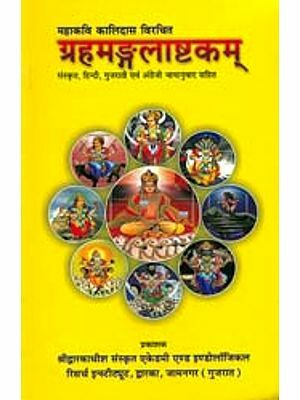 It is in this regard that the Ashtakavarga system is considered to be very authentic and decisive. 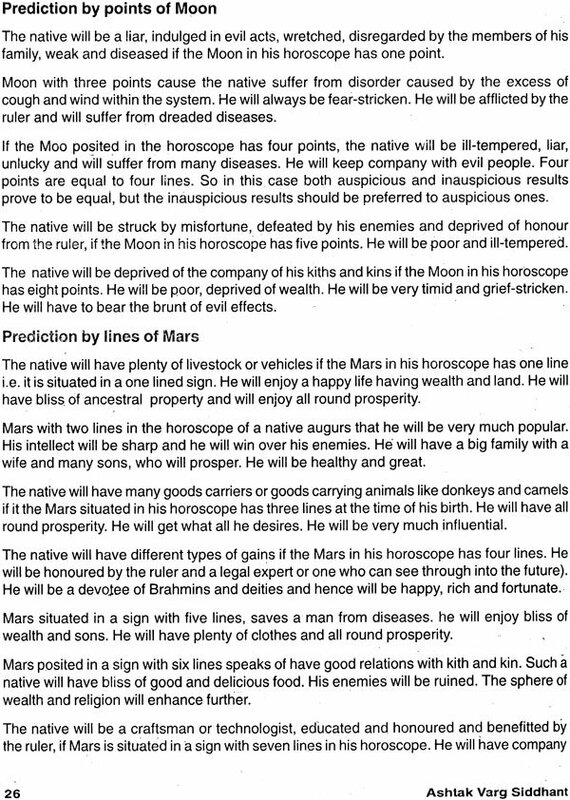 With its help, prediction regarding the ratio of gains, auspicious directions, gains from brothers, results of planets in transit etc. and the age, wealth, education, wisdom, relation between husband and wife, happiness, property, land, vehicle and deeds of a man can be made easily. To cast an Ashtakavarga, lines and points are used. A line has four synonyms –time itself, place, consequence and phase. Similarly, a point or a dot has also four synonyms-point, Karan, Daya, Aksha. While making prediction by an Ashtakavarga, it should be kept in view as to how many points and lines are there in it. Prediction of benefic results is expressed by line, whereas that of malefic ones is expressed by Zero. But in South India the benefic results are expressed by points whereas the malefic ones by lines. 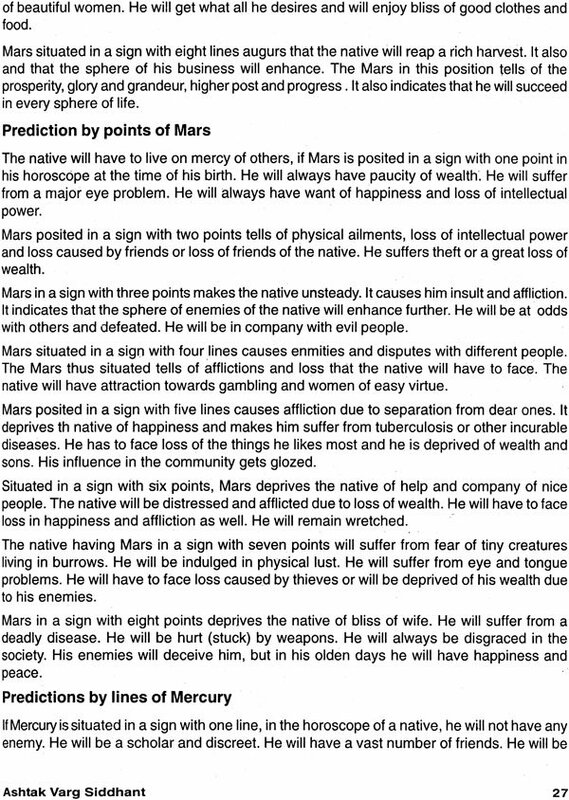 In this system, both the auspicious and inauspicious results can be forecast either by points or by lines. A result benefic by the line will be malefic by the points. Similarly, a result benefic by the point will be malefic by the line. 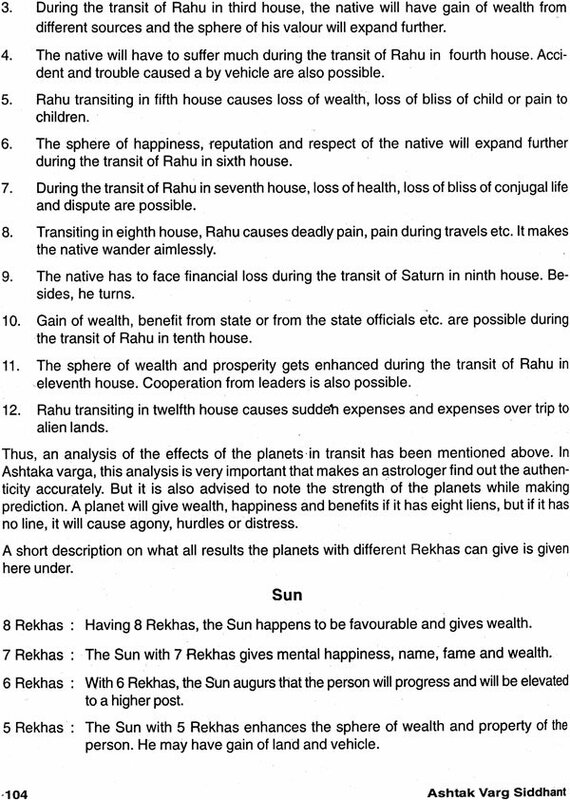 In Ashtakavarga, there are seven planets in order from i.e. Lagn Sun to Saturn. Ascendant has been accepted as the eighth planet. This is why this called Ashtakavarga. Some scholars do not accept the ascendant or Lgan. 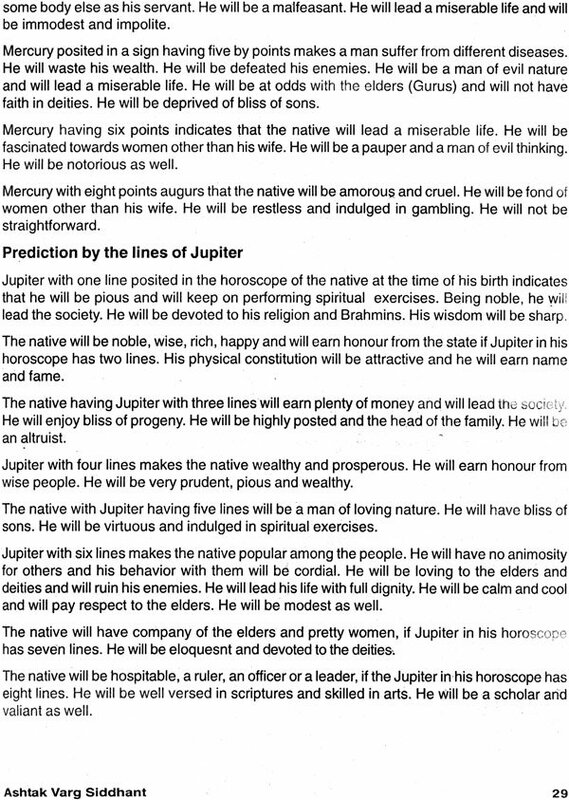 Here, a method for casting an Ashtakavarga with the planets and ascendant is given below. 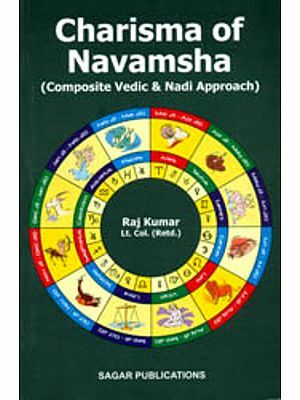 In Saryashtaka Varga auspicious lines fall on 1st, 2nd, 4th, 7th, 8th, 9th, 10th and 11th houses from where the Sun is posited in the horoscope of a person. This means that the Sun gives auspicious lines to the signs falling in Kendra, second, eighth, ninth and eleventh houses from the sign it is posited in, but it gives points i.e. inauspiciousness to the rest of the houses. 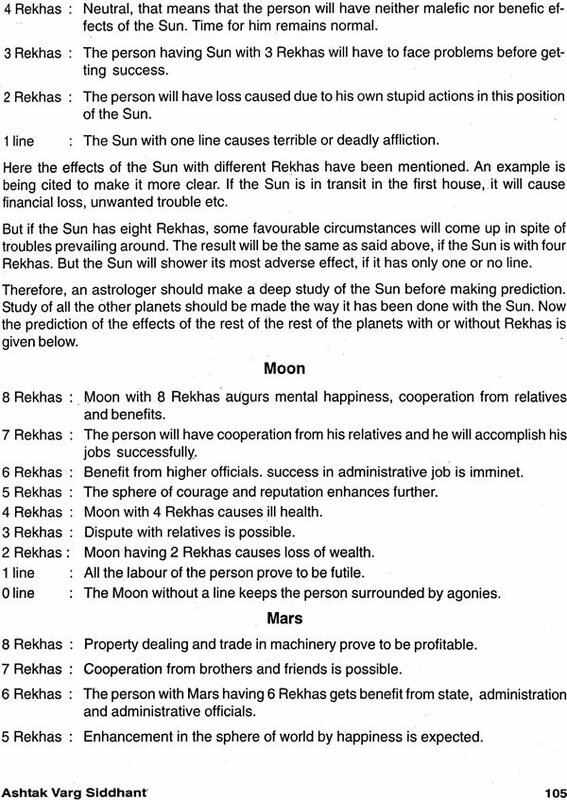 The Sun has got 48 lines in Suryashtaka Varga, rest of the planets give lines in the following manner.